So as some of you may already know, my family and I have recently relocated to Seattle! While a move of some sort was not totally unexpected, the timing and speed with which it all happened definitely left me in a bit of a daze. It’s taken me a few months to get settled, get my bearings, and get back to editing, and I sincerely thank those of you who have waited patiently for discs! I am finally wrapping up the last of my Dallas sessions (*sniffle*) and should have everything in the mail this week. Also, I wanted to give heartfelt thanks to all of my friends and family for supporting my business, short-lived though it was. I do hope to get things up and running soon here in Seattle, and I will be expanding my services to include lifestyle sessions, in addition to party photography. Those of you in the Seattle metro area, stay tuned for announcements of free and discounted sessions! I’ve been toying with the idea of adding another type of session to my product offerings, but I wanted something that was true to the spirit of what I’m already doing with parties: more candid and less posed; I love capturing kids being kids. So when a friend suggested having me photograph her three boys at the park, I jumped at the chance. She invited a few other families to join us, and I brought my husband and daughter as well. Fun was had by all, well until all the kids got hungry and melted down, haha. Here are a few sneak peeks from last weekend’s playdate. “S” was a bit of an unhappy camper by the end and only wanted to sit and wait to leave. Ah kids, so fickle. “H” aspires to be a chemist when he grows up, so it was only fitting that he had a mad scientist-themed party at the Museum of Nature & Science for his 7th birthday. 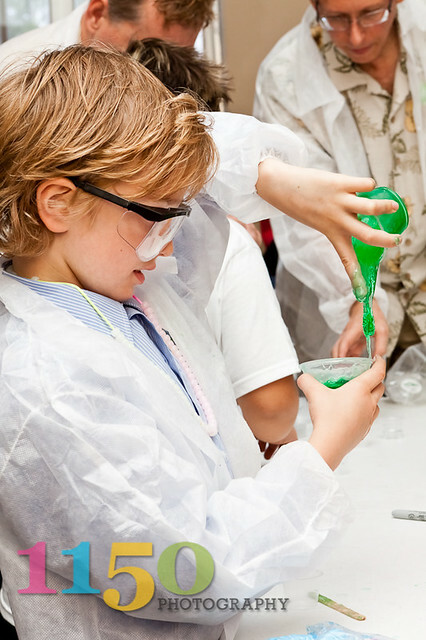 There were lots of fun experiments, including one where the kids all made their own party favors – slime! Grand opening! Plus a super special offer! I realized that, except for a quick status update on Facebook about pricing, I never posted that I am now officially open for business! Hooray! To celebrate my grand opening, I’m offering special pricing through the end of summer. Book now to take advantage of half off my regular session fee, plus discounts of either $50 or $100 off select digital packages! Click the pricing link to check out the deals, or contact me to book now!. AND as a super special offer, the first three people to book their party sessions will get a FREE upgrade to the next larger package! You must pay the deposit at time of booking to hold your spot. That means that you can get the session fee plus the “Confetti” package for $250 total, or the “Have Your Cake” package for $325! Hurry, as spots are limited!